Gianni Grippo — black belt under Marcelo Garcia — is the new Five Lightweight Champion. Gianni took the title with a win over Lloyd Irvin’s Jamil Hill. As the commentators frequently pointed out, this match was a referee’s nightmare. Gianni started in inverted guard, then went for a kneebar later on. 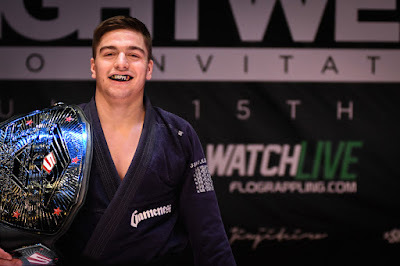 The majority of the fight, however, was spent with both competitors in fifty-fifty guard, vying for a submission or an advantage that neither could get. By the time the match had ended, it seemed to be anyone’s match. However, the referees unanimously awarded the fight to Gianni Grippo.